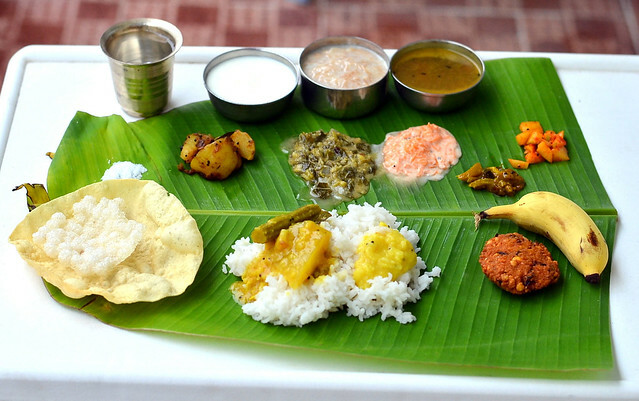 First lets see how to place the banana leaf and serve the dishes in order. 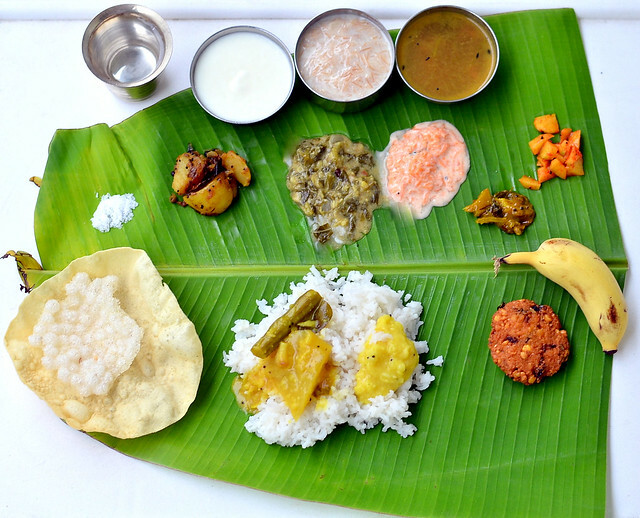 Always place the banana leaf such that the broader side of leaf should be on the right side of person who is going to eat. 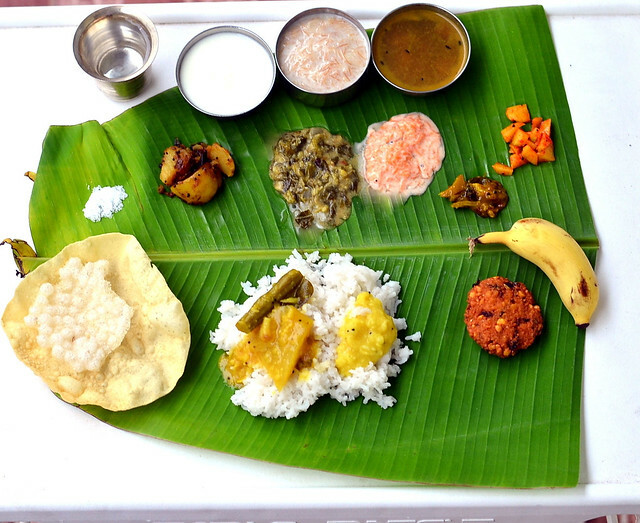 Start with salt on upper part left side of banana leaf(as shown in the pic).Some people may need more salt in dishes.Hence salt should be kept so that the person can add if its needed. Then serve the thayir pachadi on the right side upper part.Then comes kootu.Next to kootu keep poriyal,curry/roast. Here I served carrot thayir pachadi,keerai kootu and potato curry. Lastly keep the pickle varieties next to salt. Don’t forget to keep a tumbler of water. In the below part of banana leaf,keep the appalam,chips,vadam,masala vada or urad dal vada,Banana in the left side.Keep the rice in the middle of leaf and put some dal +ghee in one corner of rice.In Tirunelveli,people keep the dal in the right side and pour some ghee over it.In another corner of rice,add some sambar with vegetables. After the person finished eating dal rice,serve the sambar along with ghee if needed. Next to sambar,serve vathakuzhambu or more kuzhambu if its there. Then comes rasam.Before serving the curd,serve payasam.Some people wish to have in banana leaf and some prefer to have payasam in bowls.So serve it as per their wish. 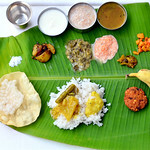 After u finish eating,if its a marriage feast,close the banana leaf by pulling the upper part and cover the bottom part with it.It signifies that the person wishes to have this kind of food very often.Whereas if u have this food in a condolence meeting,then u should close the upper part with bottom part in the reverse manner. In the previous day night,wash and soak the dal for vada.Soak it over night.Soak the tamarind in separate bowls for sambar and rasam in the previous day night. The next day morning,start the cooking at least 3 hours before serving time.First take a big pressure cooker and add the toor dal,salt,turmeric powder,hing and a drop of oil (for making sambar).Take a small container or tiffin box like thing that suits the cooker.In that,put the moong dal,water,hing, turmeric powder and a drop of oil.This dal is for serving.Wash and cut the potatoes into two and put them inside the cooker.Hope you can get the idea by seeing the picture.It takes nearly 15 minutes for cooking. In that 15 minutes of time, u can go for chopping works.First grate 2 carrots and finely chop a green chilli for pachadi.Keep in a bowl adding salt.Chop onion,green chillies,Drumstick and mango for sambar.Keep in a plate.Chop a portion of mango into small pieces for pickle.Add salt,red chilli powder and hing to it.Mix well and set aside.Now wash the greens/Keerai twice and chop it roughly.Take it in a small cooker.Chop few small onions for kootu.Keep in a plate.Chop some onions,curry leaves,mint leaves and coriander leaves for vada. By this time,the pressure would be released in the cooker, dals & potatoes would be ready.So remove the potatoes using a tong and keep them immersed in cold water.It helps to peel the skin easily.Chop them into cubes and set aside. In a small cooker,take the chopped greens,add moong dal,salt and required water.Cook for 1 whistle in low flame.It takes 10 minutes to cook. In that time,do the grinding job.First grind for vada and then for kootu.Keep them in separate bowl.Mix the chopped onions+greens with vada batter & set aside. Now you have cooked the dal for sambar,dal for serving,potato for poriyal and keerai for kootu.So pressure cooking,chopping and grinding jobs are over simultaneously. Then heat a kadai with ghee and roast the vermicelli for payasam.Add milk and cook it.Transfer the payasam into a bowl and close it with a lid. In another kadai,make sambar.While the drumstick and mango is getting cooked in tamarind extract,add the ground coconut paste to the pressure cooker in which u cooked the keerai.Let it boil for sometime till kootu thickens. Now the veggies in sambar would have cooked.Add cooked dal to the sambar and let it boil for sometime.Garnish the sambar with coriander leaves and add a tbsp of ghee at the end.Cover the bowl and set aside.Heat oil in another kadai and temper the ingredients for potato curry.Add the peeled potatoes and roast it well. Sambar,poriyal,kootu making is over.Now heat a small tempering kadai with 3 tbsp of oil and splutter mustard seeds,urad dal,curry leaves,jeera.Add half the tempered items in small quantities to serving dal( thick dal),thayir pachadi and lastly add the chopped onions in the kadai and saute till transparent.Add it to kootu.Add some coconut oil.Close the kootu with a bowl to retain the aroma. Now make rasam and close the bowl by adding a tsp of ghee.Add some water to the tempered moong dal along with salt and hing.Mix well.Similarly add the curd to the grated carrot with some salt.Mix well.Thayir pachadi is ready. Just 45 minutes before serving,pressure cook the rice in one burner.Heat oil for deep frying in another burner.Make vada,roast papad,chips or vadam.That’s all.Rice,Sambar,rasam,kootu,curry,thayir pachadi,paruppu/dal,vada,appalam is ready. Start to serve following the above mentioned order.Enjoy the feast ! TIPS : Add a tbsp of ghee in the sambar,garnish with coriander leaves,check for salt and close the lid of sambar bowl.Addition of ghee & coriander leaves gives a nice aroma to the sambar.Similarly add a pinch of sugar and a tsp of ghee to rasam.It enhances the taste and gives a clear rasam while u serve. Please check out my recipe index page for more sambar,rasam,kootu,poriyal and pachadi ideas. 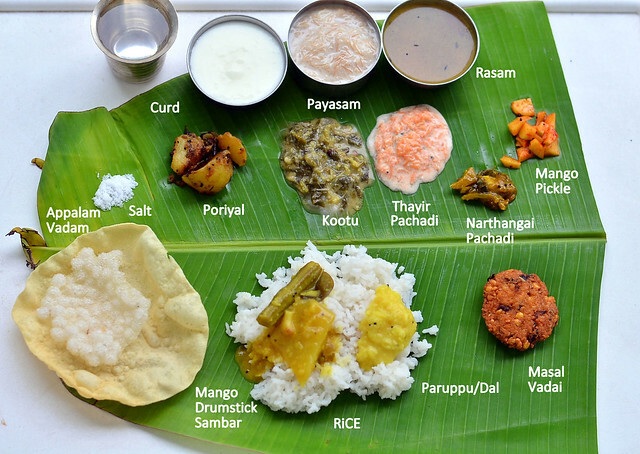 Try and Amaze your guests and family members with this South Indian Full Meals menu, get the applause !